This Post is the first of a series where I introduce Brands that are somewhat off mainstream, which might and often do show real flair and usually an individualism that can be sadly lacking in many of the better known brands. It might be that they’re relatively new or just one that appeals to a select few and fly just under the radar. Whatever the reason they are often on the short list by those looking for that elusive style or look that the mainstream can’t seem to provide. One such maker is MARCH LA.B who produce the AM2. 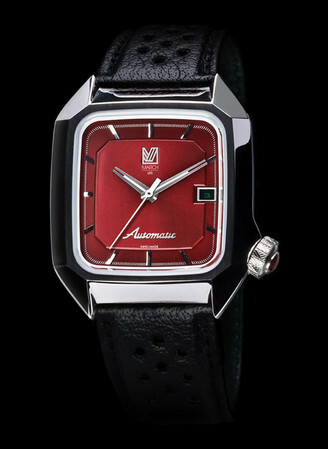 They are a France-made luxury timepiece brand with headquarters in Los Angeles, California and Biarritz, France and brainchild of ALAIN MARHIC since 2008 and the AM2 model I feature here is a model I that typifies the individual look. March AM2 in burgundy Automatic. The individuals watch. And it is different, it’s what I personally call “heavy” retro and this model actually inspired apparently by those seventies Ford Mustangs with their plush seating interiors, aggressive, charismatic and above all – individual. Certainly a different kind of presentation with the heavy polished 316L Stainless Steel case with that large heavily textured and logo’d crown bulging out from the case @4. It certainly can’t be missed, that’s for sure. First looks shows off the plush deep maroon/burgundy finish dial and domed anti-reflective Sapphire crystal. The case is 38 mm square and the watch is powered by a Swiss ETA 2892-A automatic movement with self -winding ball bearing rotor system, Date corrector, Stop seconds device and ETACHRON regulator system. It’s a pretty well specified model of that there is no doubt and at 28,800 vibrations/hr and 21 jewels should provide decent decent accuracy. 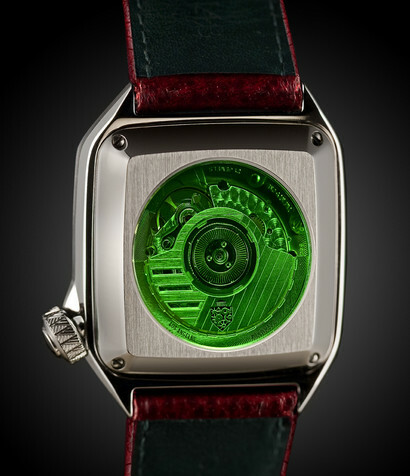 Customized ETA2892-A Swiss Automatic seen through that amazing green Sapphire crystal viewing post. The Hour and Minute hands are treated with luminous material, a sweep seconds hand, silver markers plus a customized Date set @3 against the deep maroon/burgundy color dial background are quite striking. The watch back is secured by 4 screws and the viewing window in amazing green is a Sapphire crystal, showing the customized movement inside. Note the Crown is screw down and this model has a Water Resistance of 10 ATM /100 M.
The watch has a really plush sculpted (those Mustang seats!) perforated black “buffle” band with maroon/burgundy highlights and Alcantara lining and is pretty special in it’s own right. So a true individualist model, the AM2 and I do like it, as it’s not only something different, but it’s both a quality piece and has an in your face retro style I find refreshing. And bear in mind I’m not American, so inspirational items from the USA don’t usually influence me one way or another, but with the AM2 it’s got something I can identify with, and that’s the Mustang – I mean it’s a Classic and I’ve seen the pictures and indeed the movie . . . etc. and I can see the connection very clearly. Price wise this is not unrealistic at around £750 perhaps and I’m pretty sure your next door neighbor or the guys at the Golf Club will not have one of these! You might have to see about a change of vehicle of course and then price might become an issue! And of course you guessed it – it’s now on my list! and I’m trying so hard to cut back . . . 😉 and failing miserably! This entry was posted in Fashion & Designer, Spotlight, Watch reviews and tagged Alain Marhic, AM2 in burgundy, ETA2892-A, MARCH LA.B. Bookmark the permalink.